Definitely worth seeing! Ignore the bad reviews. Clearly those who rated poorly lack judgement on what a good movie is. Go see it you won't be disappointed. Great direction and cast. Don't let the bad reviews keep you away. Its a trick! Don't fall for it. 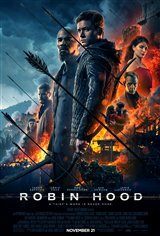 Why another Robin Hood movie, is Hollywood running out of ideas? Apparently yes. Jamie Fox was worth seeing, lots of action, but overall wait for the DVD. this is the worst movie I have seen in the last 20 years. The storyline is straight foreword and easily predicted , the plot is so simple that I believe a 15 year old wrote the screenplay. The use of semi-auto crossbows , no swordplay and the Orwellian theme and dress of the sheriff's men is laughable ..another reviewer said it was ANTIFA and I have to agree after hearing the speech by the sheriff. I asked for my money back. A refreshing and bold action-adventure brimming with heart and overflowing with joy! I haven't laughed so hard since Americathon. Always like the Robin Hood story of a more equitable distribution of wealth in order to assist our fellow poorer citizens help themselves to obtain a decent standard of livilng. Some of the acting and flow of the story could have been better. If a sequel, we'll need to demand a better comitment and the time required in making a good film if they want to make it worth our while. Liberalism is a mental disorder...please stop with these SJW, badly written movies. If Errol Flynn were alive today, he wouldnt watch this poorly scripted movie. HORRIBLE, HORRIBLE, HORRIBLE...keep your money watch something else. The screenplay is set in what appears a sci-fi genre, void of common sense, and bores the viewer which vacates the old story line in favor of a self indulgent and unauthentic shallow replacement. The peasants and well to do players are mostly well groomed and clean. The clothes and buildings are too opulent and modern to relate to the era it is supposed to represent. Concrete and steel girders adorn the buildings. The peasants appear to live in tiled houses and not huts. The Nottingham sheriff has a fresh modern day short haircut and is clean shaven and adorned in a well cut colored and modern tailored grey leather coat. Robin is well groomed and clean shaven. Marion is a peasant in this rendition and wore an impeccably clean and elegant red dress. Hollywood outdid themselves to insult the intelligence of its audience with implausible and silly special effects and costumes inappropriate and strangely beyond the technology of the era. The script was unintelligent and the acting was a disappointment. What a joke of a movie...should be paying patrons to watch this awful movie. Best part of this movie is when the credits rolled. Worst part of this movie, someone actually that this crap was a good idea to produce. SJW CRAP!!! Hollywood is getting more and more delusional. Better off watching Kevin Costner and Morgan Freeman Robin Hood, then this crap. This is a thinly vailed ANTIFA propaganda movie disguised as an action film that is supposed to possess a relevant political commentary. There are some good action scenes but it's lost in the ridiculous narrative. Classic Robin Hood! Props to everyone involved! How is it that a Hollywood Director can have all of the actors playing people from England speak with English accents except Marion who speaks in an American accent? Are there no pretty women with striking blue eyes who can speak with an English accent? Take 2 arrows and shoot the art director and the director that let them put the Sherrif of Knotingham in a grey leather jacket from le chateau and touques on the young angry mob attacking the Soldiers in armour. I thought it was okay. The ending was not what I expected. My favourite film of 2018! Expect multiple Oscar nominations. Loved the new details on how/why Robin becomes the “Hood.” Action packed, very entertaining! Great action, excellent performance by Jamie Foxx, Tuck character, always wonderful to see good triumph over evil even if it is only in the movies. I hope the sequel is equal or better than the first! I just saw a bit of a preview on TV & it was Ben Mendelsohn who looked he had an even better, prime, sharp haircut than he did in SW: Rogue One. Even Taron Egerton looks straight out of a barber shop! In the Middle Ages!?!? Really!?! You lost me there already. Spent time re-watching my DVD of Robin Hood (2010 with Russell Crowe). Way better. If not for the cheap ti**y show it would not have even rated one star. Stay home and watch some television. Ewwww. I work at a movie theater because i'm a big movie addict. This gets a two out of ten from me. It's been done to death and this offers nothing new except scenery. Hollywood has no new ideas. Next up, another Three Musketeers, another Rocky movie, another Grinch, another Fantastic Beasts, another repeat and another repeat. They're working on a Matrix 4, and soon, another Harry Potter. Theatres and the entire movie industry is choosing self annihilation. Highly entertaining, high on octane and a great movie. those who gave it one star, don't understand movies. Outstanding! One of the most entertaining pictures of the year! Exceptional look at the famed hero who robbed from the rich to give to the poor.